← Season’s greetings from Doorstuff! Introducing the Optimo pocket door gear, a superb pocket door kit which gives the magic 100 millimetre finished wall thickness. A strong pocket door design in construction, assembly and operation, the Optimo pocket door is a simple way to increase available room space in many domestic and commercial applications. The kit comes complete with all fittings required for a single or double pocket door. 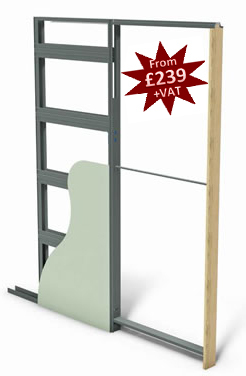 The standard kit is designed for doors from 25mm up to 44mm thick and comes complete with timber jamb set. Now in stock from £239 +VAT delivered. This entry was posted in accessories, digital locks, door closers, door handles, hinges, panic hardware, pocket doors, service, sliding door gear, window operators and tagged 100mm finished wall thickness, Optimo, pocket door, pocket door gear, pocket door kit, sliding door gear. Bookmark the permalink.